This is the second prototype of the Programmer's Keyboard v3. 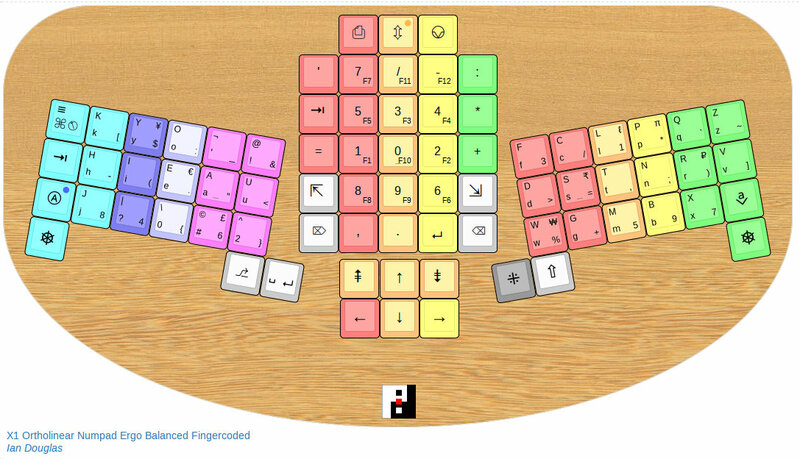 It's basically the same as the I-Board except it's now balanced, by moving the I keys to the centre. I've also moved the side clusters in closer, makeing it easier to hit the backspace and delete keys. This is a prototype design, I have no idea how practical it will be (yet). The text labels have been replaced with mostly-Unicode symbols, while the AltGr key has now become the NumPunc key, for accessing the digits and punctuation on the alpha keys. Alt-Ctrl-Del is doable on the left hand.